Welcome to our Jewish traditions collection. This collection has been requested for the past few years and we didn't quite know how to approach it until now. We decided to create a classic elegant collection to honor Jewish traditions. 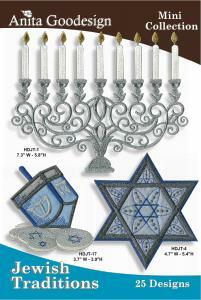 There are beautiful Menorahs, dradle's and star of David. We've included large and small designs to decorate a garment or home decor item. There are also a few quilt designs that would add class to any project. We designed two different table runners for this collection.